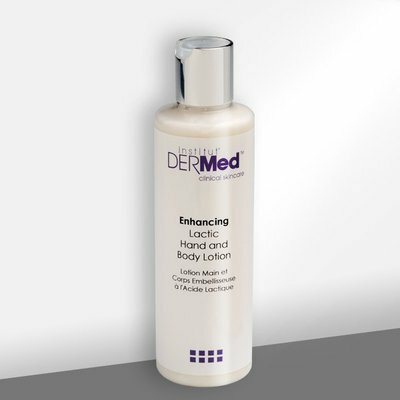 the rich, deeply hydrating Institut’ DERMed Enhancing Lactic Hand and Body Lotion,is formulated with Lactic Acid and Shea Butter to create a luxurious, soft silky skin look and feel. Smooth onto the body every morning and/or night. Lactic Acid - Derived from sour mil, yogurt or beer used for its potent acidic properties to gently exfoliate and clarify the skin without dehydration. Shea Butter - Increases cellular hydration and moisture retention. Water, Caprylic/Capric Triglyceride, Cetearyl Alcohol, Squalane, Cetearyl Olivate, Lactic Acid, Glycerin, Sorbitan Olivate, Butyrospermum Parkii (Shea) Butter, Simmondsia Chinensis (Jojoba) Seed Oil, Vaccinium Macrocarpon (Cranberry) Aromatic Extract Blend, Butylene Glycol, Hyaluronic Acid, Hydrolyzed Yeast Protein, Acetyl Dipeptide-1 Cetyl Ester, Undaria Pinnatifida Extract, Glycyrrhiza Glabra (Licorice) Root Extract, Oat Extract, Centella Asiatica Extract, Echinacea Purpurea Extract, Anthemis Nobilis (Chamomile) Flower Extract, Symphytum Officinale (Comfrey) Rhizome/ Root Extract, Paullinia Cupana (Guarana) Extract, Helianthus Annuus (Sunflower) Seed Oil, Rosa Canina (Rosehip) Seed Oil, Tocopheryl Acetate, Tetrahexyldecyl Asc orbate, Sorbitan Laurate, Xanthan Gum, Potassium Sorbate, Citrus Aurantium Dulcis (Orange) Peel Oil, Citrus Grandis (Grapefruit) Peel Oil, Dimethicone, Hydroxyethylcellulose, Phenoxyethanol, Ethylhexylglycerin, Sodium Hydroxide.